A surgical technologist, or surgical technician, assists surgeons and other medical staff before, during, and after surgery is performed. These specially-trained individuals help ensure surgeries go smoothly and successfully. Some of the duties a surgical technologist is responsible for include: preparing the operating room, tools and equipment before the surgery begins, assisting surgeons during surgery, and various duties post surgery such as cleaning equipment, taking inventory of supplies, and preparing for the next procedure. Surgical technologists work with surgeons and other medical staff to help ensure that surgeries are executed in a safe, successful, and smooth manner. Surgical technologists need to have both educational and clinical training to perform their job successfully. Surgical technologists work as part of a highly skilled and technical team, so they need to work well with others, take direction, and be able to understand medical terminology and methodology. In addition to their clinical duties, the surgical technologist will often greet and assess patients before procedures are performed. Qualified surgical technologists help surgeons perform their job well and also increase patient satisfaction by helping to provide quality care. A first surgical assistant is a surgical technologist who has undergone additional training and often specializes in a specific type of surgery. 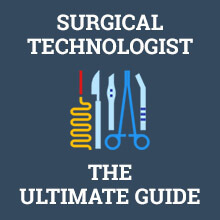 The duties of a surgical technologist are varied and highly technical. Surgical Technologist Salary – How Much Does It Pay? Surgical technologists can expect to earn a median salary of approximately $44-46,000 annually. Entry level surgical technologists earn around $38,000. Surgical technologists on the high end of the wage spectrum may earn up to $67,000. Rates of pay will depend on region, education level, experience, and type of employer. Obtaining certification is not always required, but will most likely increase the rate of pay received. Surgical technologists working in a dental office earn a median wage of $44,760, while those working in outpatient care centers earned a median wage of $48,900. First surgical assistants will earn a higher rate of pay, due to their advanced specialized training. Self employed surgical assistants will be able to set their own rate of pay with different clients on a contractual basis. Start your journey to becoming a surgical technologist by earning your high school diploma or GED. There are different options for getting proper education and training to become a surgical technologist. You can choose to obtain an associate’s degree in surgical technology, which may be done through a community college or vocational school. You can also decide to complete a certification program. If pursuing an associate’s degree, choose a program that is accredited by the Commission on Accreditation of Allied Health Education Programs. You will need to complete classes such as: microbiology, pathophysiology, pharmacology, anatomy, physiology, and medical terminology. You will also need to learn about anesthesia, ethical and legal considerations, interpersonal skills, and how to use computers and medical equipment. If you plan to become a certified surgical technologist, first check to see that the CST program you plan to complete will satisfy the requirements of the certifying agency. If your goal is to become a first surgical assistant, you will want to choose your specialty and then complete the specialized training specific to that position. Education to become a surgical technologist takes between one and two years to complete. Becoming a certified surgical technologist is not required by every state, but it will help you succeed. Employers prefer to hire certified surgical technologists because they know they have been sufficiently trained and tested in the field. Each certifying agency has different requirements for taking the exam. Before signing up for coursework, ensure that you are taking the correct classes with a qualifying institution. Some states regulate the requirements for being a surgical technologist, so check where you live to see if these rules may apply to you. After receiving sufficient education and training, you’re ready to start applying to jobs to become a surgical technologist. If you have completed the requisite training, education, and certification, you will be fully prepared to get a job. Most vacancies can be found in hospitals, but surgical technologists also work in physician’s offices, dental offices, and outpatient care centers. Having previous work experience in the medical field is not required, but helpful. As you gain more years of experience, you should begin earning higher rates of pay. Your career as a surgical technologist will be a rewarding one, knowing that you are helping people through difficult and stressful moments in their lives, along with helping surgeons and other medical staff to successfully perform their work. If you have chosen to become a certified surgical technologist, you will need to follow the certifying agency’s requirements for keeping your certification. This may involve taking continuing education credits or retaking the test every 4-5 years. Fees may also be required to renew your certification. Letting your certification lapse may cause employers to question your commitment to your profession, so it’s always best to fulfill the requirements needed and hold onto your certification. Whether you are seeking an associate’s degree in surgical technology or are completing a certification program, both will provide you with a well-rounded education in the field. The time to complete your education will be between one to two years. Because surgical technologists have such a highly technical, rigorous and critical job, proper training is essential. This education prepares you for all of the situations you will encounter on the job. It will also prepare you for the certification exam, if you choose to become certified. You will receive training in microbiology, pathology, wound management and closure, transfusions, anatomy, pharmacology, and much more. You will also learn about ethical and legal matters, bioscience, interpersonal skills, surgery complications, computer technology, and the fundamental technical skills required to do your job well. Part of your education will include hands-on practice in clinical settings. This will give you practice in sterilization, assisting medical personnel in surgery, and working with others as a team. Advanced training will help you become an expert in the specialization you have chosen. First surgical assistants can choose to specialize in cardiovascular, plastic, robotic, spinal, trauma, orthopedic, head and neck, thoracic, vascular, or many other types of surgery. Generally, the more education and training you receive, the higher the rate of pay you can expect. Be sure that your institution has been accredited by either the Commission on Accreditation of Allied Health Education Programs or the Accrediting Bureau of Health Education Schools. Tuition for a typical one-year course can cost about $6,500, plus additional fees and expenses. Tuition will be higher to get an associate’s degree, and varies from school to school. Usually, tuition is lower for a community college in the region in which you live. Once you complete your coursework, you will be fully prepared to perform your job duties when you begin work. Not all states require surgical technologists to be certified, so first be sure to check your particular state’s requirements. Regardless of the laws, it is always to your benefit to hold an active certification. There are different certifications available for surgical technologists. Different certifications hold different requirements. Some certification programs allow you to be eligible for testing with a certain number of years of experience or received appropriate medical training through the United States Armed Forces. For instance, you may take the NCCT test if you have three years of full time experience as a surgical technologist working under a certified/licensed physician, primary care provider, or a registered nurse. You will need documentation from your employer(s) to verify these hours worked. You are also eligible for the NCCT if you completed a formal medical services training program related to surgical technology through the United States Armed Forces. You will need to submit proof of your completion of this program. It is important to map out your goals and how you plan to achieve those goals before enrolling in courses. Be sure that whatever education and training programs you enroll in are through accredited organizations and will fulfill any requirements needed to obtain your certification. Testing for certification can cost between $150 and $250. To maintain your certificate, you will probably have to enroll in continuing education courses. Another option may be to retake the test within a certain period of time. Check with the organization to find out everything needed to maintain in good standing. Currently, no states require surgical technologists to be licensed, but some require registration with the state. The job outlook for surgical technicians is good. According to the U.S. Bureau of Labor Statistics (BLS), there were about 100,000 people in the United States employed as surgical technologists in 2014. The steady growth rate of this profession promotes a positive outlook for future employment in this field. If one has an aptitude for the medical profession, is an excellent team player, and has a desire to help others, becoming a surgical technologist may be a lucrative option. This position is vital for hospitals and other medical centers that perform surgery. A good surgical technician is a valuable asset to any surgical team. That's a higher than average projected growth of 12,600 jobs. Should You Become a Surgical Technician? Surgical technologists overall experience job high satisfaction. This position provides a significant contribution to the health and welfare of their communities. Individuals who wish to work closely with surgeons in the medical field will find this to be the perfect position. Surgical technologists have extremely important job duties, and must be very detail oriented and organized. Individuals who are unable to handle a high stress position should not choose this path for their career. The training period to become a surgical technologist is relatively low, with other comparably paid jobs in the field requiring additional years of education and training. The salary earned as a surgical technologist will depend on location, type of employer, years of experience, and type of education and certification received. The average salary of a surgical technologist is $44-46,000 annually. When a surgical technologist first enters the workforce, they can expect to earn around $38,000. As their experience level grows, their rate of pay should increase. Working for the same employer for a number of years should also result in an increase of pay. Those seeking to earn even higher wages should consider becoming a first surgical assistant. First surgical assistants earn more money and have the flexibility to be self employed, often working on a contractual basis. There are over 100,000 people currently employed as a surgical technologist in the United States. The annual job growth outlook for surgical technologists is 12-15%, according to the U.S. Bureau of Labor Statistics. This rate is much faster than average. As with other jobs in the medical profession, the increased elderly population in the United States has contributed to an increased demand for surgical technologists. Because the duties of a surgical technologist are essential for the success of surgeon’s work, there will always be a need for this critical position. On average, it takes between one and two years to complete training to become a surgical technologist. Compared to other moderately paying jobs in the medical field, the length of training is slightly less than other positions. Some techs may seek additional training, particularly if their goal is to become a first surgical assistant. To maintain a certification as a surgical technologist, continuing education classes will mostly likely need to be taken on a regular basis. With advances in technology happening all the time, techs will need to be sure they are keeping up with these improvements. The job of a surgical technologist is an important one. By assisting surgeons and other staff during operations and other procedures, it is vital that surgical technologists always perform their work with utmost precision every day. Q. How long is the training to become a surgical technologist? It takes about one to two years to complete the training required to become a surgical technologist. Many surgical technologists receive their education through a community college or vocational school. Some students will obtain an associate’s degree in surgical technology, while others will complete a certification program. Those who wish to become a first surgical assistant will need to take additional training in the specialization of their choice. After obtaining a certification, continuing education classes are often required to renew the certification. Q. What qualifications do you need to become a surgical technologist? You must first have a high school diploma or GED. Then, you will need to complete either a certification program or obtain an associate’s degree in surgical technology. 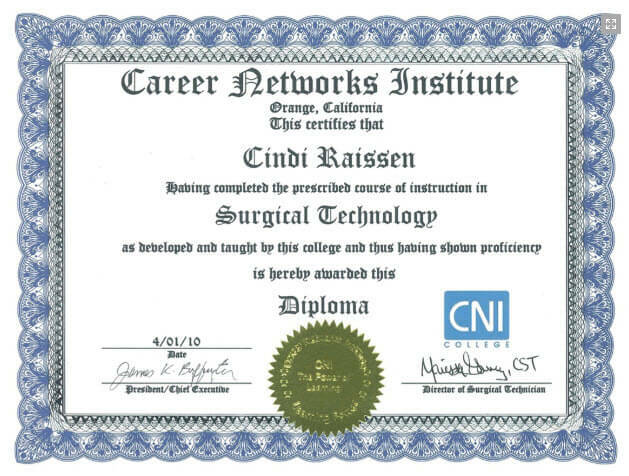 Although it is not required, it is recommended that you obtain an surgical technologist certificate. You also need to have certain skills, such as being organized, conscientious, and able to work successfully with other medical staff. You will also need to be able to handle highly sensitive and stressful situations on a daily basis. Q. How much do surgical technologists make in a year? The average pay for a surgical technologist is about $44-46,000. Wages vary depending on the employer, as surgical technicians working in a dental office will earn less than those that work in a hospital. Entry level surgical technologists can expect to start at around $38,000 per year. First surgical assistants are a specialized, highly trained form of a surgical technician, and make an average of $62,000. Q. How many hours does a surgical technologist work in a week? The working hours of a surgical technologist will depend on their employer. Many surgical technologists will work 40 hours, within normal daily hours. However, surgical technologists working in a hospital may be assigned shifts around the clock. In certain instances, emergency surgeries may require overtime or off-hours work. First surgical assistants who are self employed will set their own hours, however they will have to coincide with their client’s surgical appointments. Q. What is the cost of training to become a surgical technologist? The tuition for a one-year course in surgical technology can cost around $6,500. Additional costs include administrative fees, supplies, books and other items. Tuition to obtain an associate’s degree will vary greatly, depending on the type of school attended. If one is seeking to obtain certification, there will be testing fees as well. If one already works for a medical practice or hospital, it is possible that their employer will contribute funds for education and/or certification costs.